Coach Sergio Scariolo talked the day before the game EA7 Emporio Armani is scheduled to play in Kaunas against the so far unbeaten Zalgiris team: “We want to step on the court knowing we’re playing one of the best teams in Europe right now, maybe the best. Their roster, the quality of their play and the results are pretty much clear, they have won on the road against Caja Laboral and Olympiacos, they’ve beaten CSKA Moscow. We’ll play in a great atmosphere, before extraordinary fans capable to create a great climate throughout the game. We’ll need to turn those obstacles into great motivation, to be competitive and focused, capable to handle mistakes, difficulties and keep going with no letdowns. We’ll have to react with positive energy”. Keith Langford has this to say: “We know we’re going to play against one of the top teams in Europe and that’ll be our approach. When you play the best you’ll know exactly where you are at and who you are. At the same time we want to do our best and try to go back to Italy with a win. 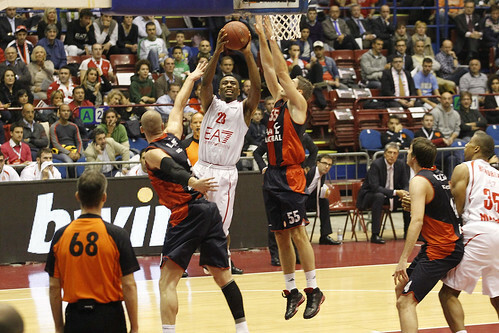 Against Zalgiris I set my personal best in Euroleague, scoring 35 points. But it was a different team, a different coach, so it’s not correct to think about that and to remember that game. It’s a just a new chapter, a new story and my focus is entirely on this game”.